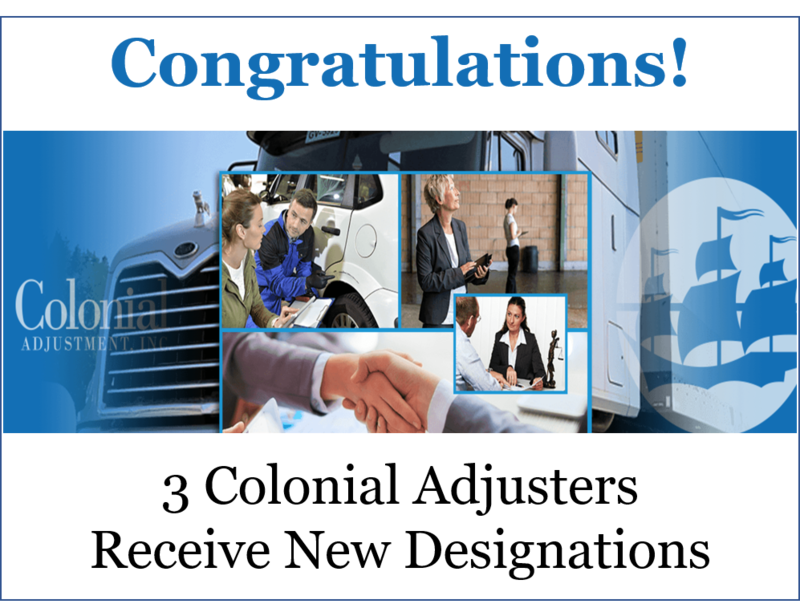 At Colonial, we recognize that it is our exceptional and dedicated staff that set us apart, and deliver on our client promise each day. This year at our Annual Meeting we acknowledged one of those exceptional team members, Senior Property Adjuster, Brandon Robertson. 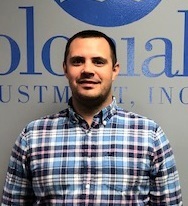 Brandon joined Colonial in 2014, having previously worked for a large insurance company as a property adjuster, as well as a large construction firm where he was responsible for sales and estimating, and completing insurance loss estimates. In his time with Colonial, Brandon has skillfully managed covering claims for an enormous territory, and ascended the Colonial ladder very quickly due to his superior work ethic and commitment to doing his very best every day. Brandon has been recognized throughout his career for providing detailed investigations and exceptional customer service. Brandon is energetic and has effectively managed multiple high priority projects, and large, complex losses. He is always available to cover weekend and holiday calls, handling losses in both property and GLPD claims. Brandon’s positive attitude, professionalism and commitment to our clients shows in each claim that he handles. He has proven to be a natural leader at Colonial, coaching and training new employees, and readily sharing his knowledge with his coworkers. Brandon leads by example and we are very pleased to present him with this year’s Exceptional Service Award. It is always difficult to say farewell to a member of our Colonial family. So it is with mixed feelings we announce that General Adjuster, Duane Fricke, is retiring effective in June. 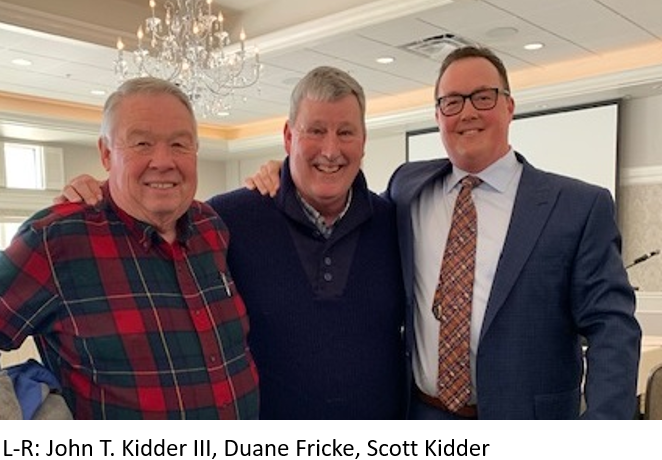 Company founder, John T. Kidder III, who brought Duane to the company originally, was on hand at our Annual Meeting to give his well-wishes to Duane. Duane has had an impressive career with 45 years under his belt in adjusting, claims management roles, and running CAT operations throughout the Northeast. He began his insurance career in 1974 with a national independent adjustment company, learning the ropes in property adjusting and quickly advancing his career to claims management roles. Prior to joining Colonial Adjustment in 2006, he worked for a major carrier as a General Adjuster in northern New England, responsible for large commercial and personal lines property claims. His work with Colonial has included traveling the expanse of Maine, New Hampshire and Vermont territories providing his expertise in handling major losses, representing the Colonial brand in establishing our current market footprint, and promoting our future growth with his considerable knowledge. Duane’s expansive career handling major losses has made him an invaluable member of our Property division. His Midwestern perspective, sensibility and humor will be missed! Duane is headed to Florida with his lovely wife Christine, to enjoy some golf and frequent visits with their sons and grandchildren. We extend our most heartfelt best wishes as he begins this new phase of his life. 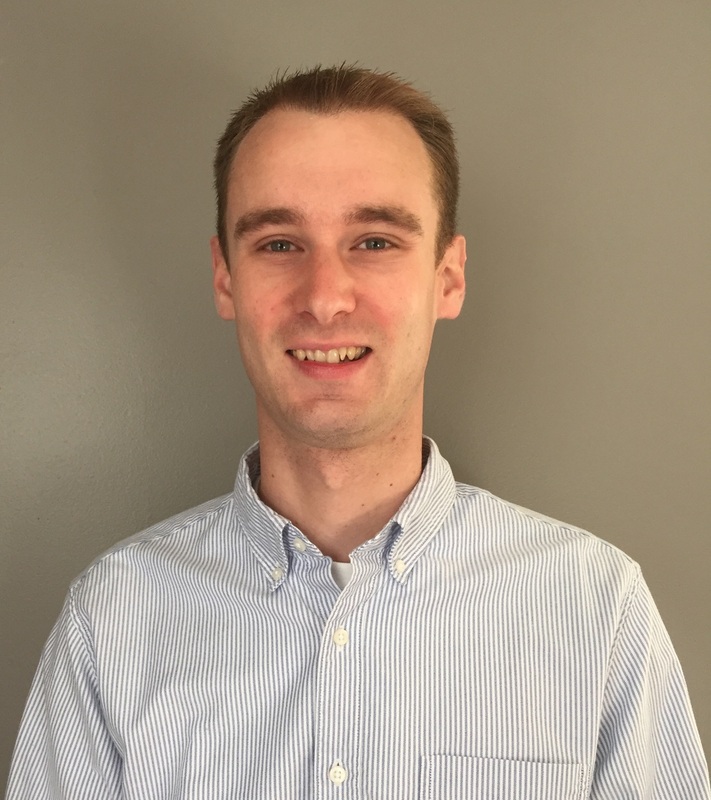 Ryan joined Colonial in 2013, and has consistently worked to expand his knowledge and grow as an insurance professional, earning his AIC designation in 2016. He is one of our most versatile adjusters, and demonstrates his dedication to the needs of our clients by consistently volunteering to work GLPD and other casualty claims on top of his demanding property claim workload. Ryan seeks out exposure to larger losses, and he has effectively handled a number of major commercial and residential losses. Ryan was selected as a member of Colonial’s Efficiency Committee, and participated in a field-study in the use of mobile devices to prepare estimates in the field. Additionally, he has sought out leadership roles in training and mentoring new employees at Colonial. Ryan deeply values building relationships, serving as a board member for the Southern Maine Claims Association, and the Maine Junior Agents Association. Ryan possess a drive and work ethic that serves as a tremendous example to emulate, and we are very pleased to advance his designation to that of Senior Adjuster. Scott joined Colonial in 2015 from an independent insurance company, and has proven himself as a true workhorse, dedicated to the needs of Colonial and our clients. He has handled a number of larger losses, effectively communicating with the involved parties and recognizing the need for various consultants to help determine the cause of the loss and scope of damage. 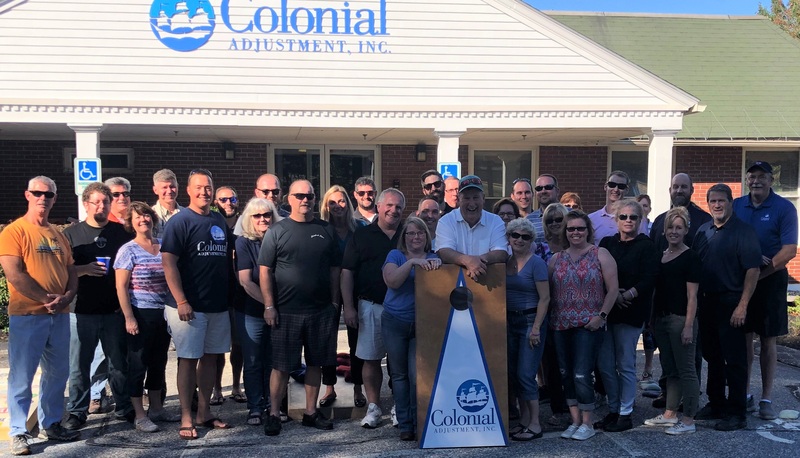 Scott has handled over 950 losses, across Maine, New Hampshire and Vermont, during his tenure at Colonial since his hire date, more than any other adjuster in the company during the same timeframe. Scott distinguishes himself above his peers in both production and performance. During times of increased workload, he embraces the challenge and pushes through. He is always willing to work the arduous hours necessary to meet client demands, and will accept, even request, additional work. Scott is a true asset to Colonial Adjustment, and we are pleased to promote him to the level of Senior Adjuster. John began working at Colonial in 2015, and has helped increase our market share in Vermont through his hard work and determination. He consistently rises to the needs of our clients, always willing to cover our Emergency Claim hotline, while handling a multitude of large claims. John has handled over 725 losses since his employment with Colonial in both Vermont and New Hampshire. John has excellent communication skills, which enable him to work through disputes concerning the scope of damages and costs with insureds, contractors and public adjusters. No matter how many claims he has on his plate, he remains unflappable, and is always up to the challenges that adjusting presents. We are very pleased to advance John to the designation of Senior Adjuster. Kevin has been working as an independent adjuster for a firm in Rhode Island, and was previously an adjuster with a large national insurance company where he handled homeowner losses. He has a broad range of adjusting experience, and earned a degree in business administration from Liberty University. Kevin enjoys the opportunity property adjusting offers to travel throughout New England and explore new places. He will be handling claims for Colonial in the New Hampshire and Central Vermont areas. Kevin is originally from Rhode Island, and moved to the Keene, New Hampshire area with his wife and their two young children. He enjoys coaching high school football, and loves to spend time with his family playing and watching sports of all kinds. Colonial is pleased to have Kevin joining our Property team! He can be reached at kmimande@colonialadj.com. 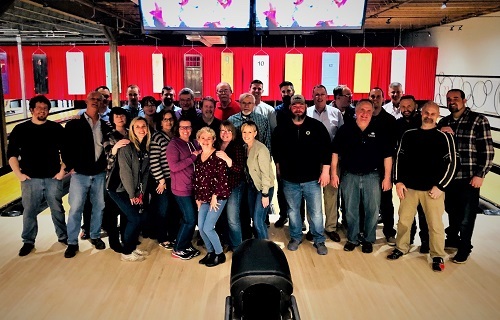 We value the hard work of our staff, and believe it is important for us all to relax and have some fun together once in a while! 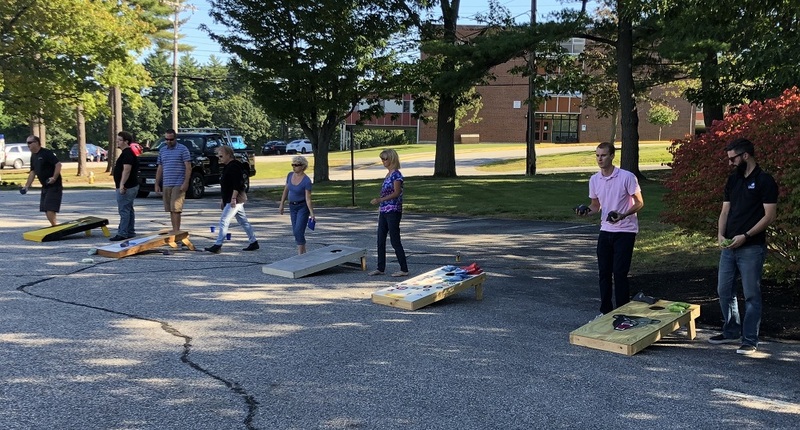 Our Headquarters affords us some great outdoor space, and this past week we enjoyed some downtime together at what has become an annual beanbag toss event. 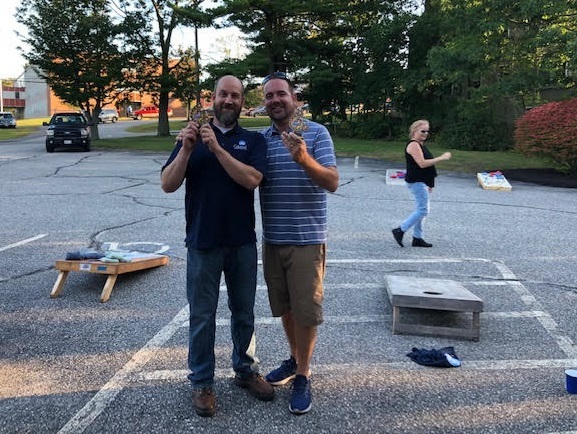 Serving as our summer Employee Appreciation Event, we took advantage of the last of Maine’s summer weather for some friendly competition during this 3rd Annual Tournament and BBQ. 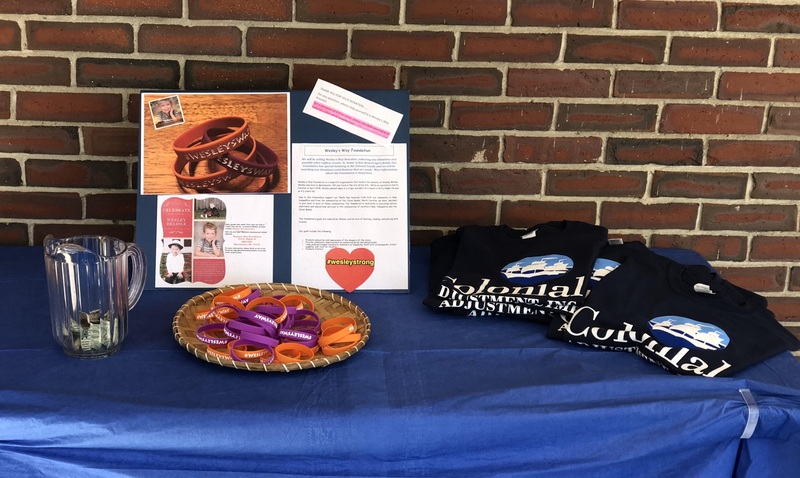 This year’s event was made more special with an employee-driven fundraising effort throughout the day for Wesley’s Way Foundation. Colonial will be making a matching company gift as well for this important cause that helps so many in need. A big thank you to Sandra Fogg for organizing the event for us! Congratulations to this year’s champions – Matt Peck (L) and Luke Provost (R). 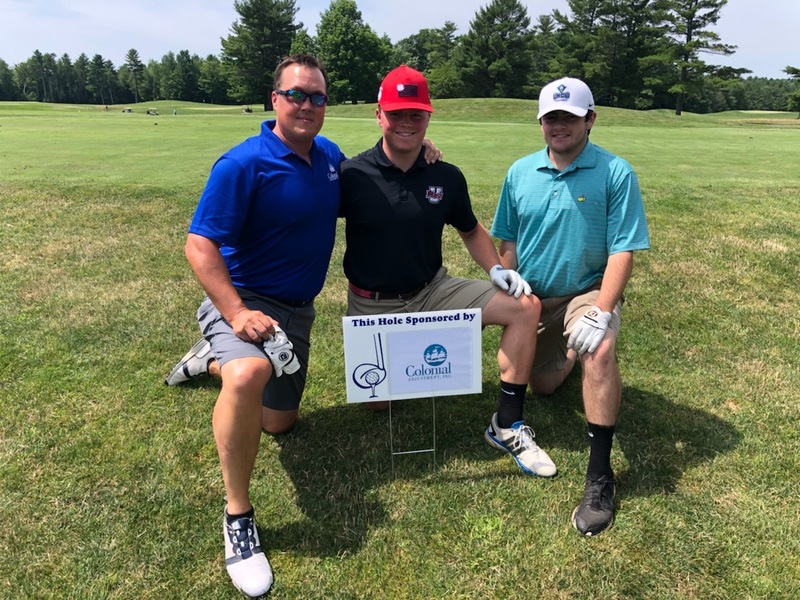 Recently, Colonial sponsored a hole at the Maine Insurance Agents Association’s Young Agent Annual Golf Tournament to support their Scholarship Fund. 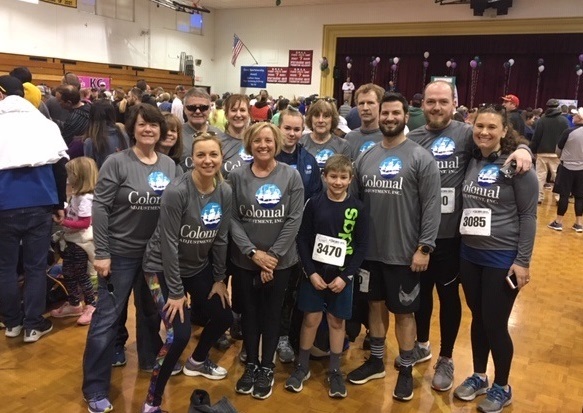 Supporting community and families is an essential part of our values here at Colonial, and as a family-owned business it was fitting that our CEO/President Scott Kidder was joined by his son, Jack. 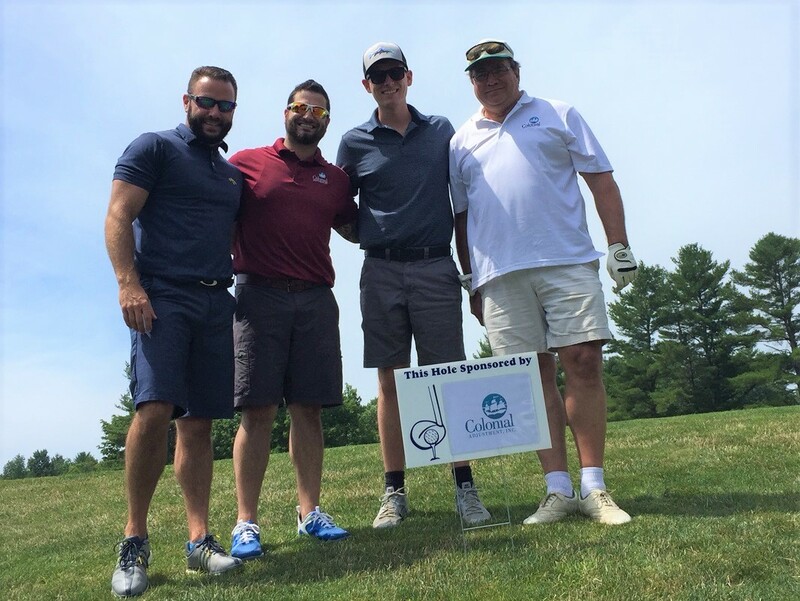 We are always happy to support such a great event and have the chance to get some fresh air out on the golf course during a beautiful Maine summer day! Company CEO, Scott Kidder (left) was joined by his son, Jack, and friend Aiden Smith. Property Supervisor, Peter Dube (left), along with Colonial adjusters Michael Riesbeck, Clayton King and James Provost enjoyed playing a round of golf while catching up with clients and friends during this great event!